The Development Academy of the Philippines’ Public Management Development Program (DAP-PMDP) welcomed the pioneer batch of its Senior Executives Class Shuttle Course (SSC) last January 23 at the DAP Building in Pasig City. Hailing from eight government agencies and three state universities, the 16 senior executives are embarking on the PMDP’s first run of the alternative mode of its Senior Executives Class. The new wave of PMDP scholars was welcomed by DAP President Atty. 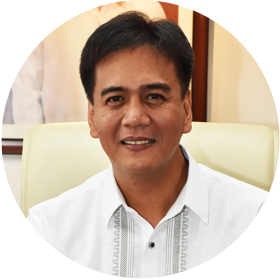 Engelbert C. Caronan Jr., MNSA, who underscored creativity and innovation as the backbone of public sector productivity. Undersecretary of the National Economic and Development Authority’s Central Support Office Jose Miguel R. de la Rosa also addressed the scholars, keynoting the opening program as alumnus of the Career Executive Service Development Program (CESDP) and as one of the pioneer participants of the PMDP’s training module on Phronetic Leadership. “As participants and soon-to-be graduates of this course, you are expected to exercise and show competence, integrity, and commitment, as a fitting obligation to yourself and to the Filipino people,” De la Rosa told the scholars. The SSC was designed to extend the program to potential SEC scholars who cannot be tied to the class’ residential schedule at the DAP Conference Center in Tagaytay City. Compared to the three-month residential training of the regular SEC, the shuttle course is delivered in a 2-to-5 day module conducted at the DAP Pasig every month for one year. The scholars will also take part in a basic masses integration dubbed as “Sensing Journey,” as well as a foreign study mission in an ASEAN member country. Ultimately, the SEC curriculum aims to generate policy and management case papers called “Capstone Papers,” which aim to shape and influence policies in the scholars’ respective agencies. 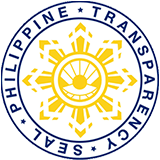 The PMDP continues to seek potential scholars with managerial and executive public posts from regional agencies, attached agencies, constitutional commissions, government-owned and controlled corporations (GOCCs), legislative branches, and state universities and colleges (SUCs). Nominations for the PMDP’s scholarship grants are currently being accepted for the 20th batch of its Middle Managers Class set to open in March 2019. 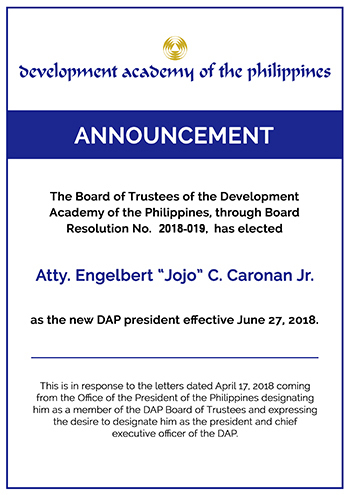 Interested parties are advised to contact the PMDP through https://facebook.com/PMDPParaSaBayan or via (02) 631-2128 / (02) 631-0921 L125.